Tacos, tequila and an eye-popping resort backdrop make dining here feel like a fiesta. : Located at splashy, colorful The Saguaro Palm Springs, El Jefe opened in 2012 under the direction of “Iron Chef” winner Jose Garces. 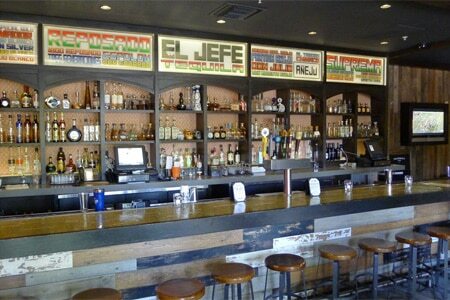 Since then, Garces and the resort have parted ways, but El Jefe lives on with its zesty menu and tequila-infused drinks. The restaurant is all about small plates and breaking bread with your dining companions, sipping fresh fruit margaritas and mezcals, and lingering over hand-mashed guacamole and house-made plantain chips. Tacos and tortas are bite-size and filled with grilled skirt steak, braised pork shoulder, crispy mahi mahi or a medley of vegetables, and then punctuated with flavors and textures that include roasted mushrooms, queso fresco, chipotle rémoulade and pickled red cabbage. Choose from a handful of craft and Mexican beers available on tap or by the bottle. When the mood calls for something with a bit more bite, take a taste of the Hemingway, made with jalapeño-infused tequila, Maraschino and grapefruit.